To discuss the evolution of gear coupling, we first need to discuss the history of general couplings. The first type of coupling used was a flexible coupling. It’s said that the used of this coupling came with the invention of the wheel. The invention of the wheel itself, according to many historians, has its roots with the Sumerians more than 5000 years ago (Tigris and Euphrates rivers region). Earliest history known today tells us that flexible couplings and universal joints were used by Greeks around dates 300 B.C., and the Chinese around A.D. 25. The Flexible coupling was invented by Jerome Carden in 16th century. It was a simple device consisting of two yokes, a cross and four bearings. This joint is still being used with modern modifications and known as the ancestor of all flexible couplings. In 1650 Robert Hooke developed the application of Hooke or Carden Joint. During the period between 1700 and 1800, there were no major advancements recorded in history until the industrial and automobile revolution. In 1886 Roots developed a theory that if the flange of rigid coupling thin down then it would flex and prevent the equipment and shaft from falling down. This idea is still used in modern diaphragm couplings. In the period 1900-1930 many coupling manufacturers were established. The rapid advancement and expansion in couplings was direct result of the invention of the automobile in 1920s. In the period 1930-1945 gear couplings were introduced into the industrial market. In the 1940s and 1950s technology was advanced rapidly. Rotating equipment was introduced in this period. By time larger and higher horsepower equipment came into use which brought the need of more power dense flexible coupling with great misalignment to be accommodated in systems. Around this time fully crowned gear spindle was developed and introduced into the steel industry. In the period of 1945-1960 gas turbines, generators and compressors were introduced and they were becoming more and more popular by the day. This brought out the requirement of higher speed couplings. So gear couplings were upgraded to handle more power and higher speeds. But with rotating equipment and higher operating speeds brought a lot of systems problems regarding gear coupling failure due to torsion or weight of the couplings. So lighter weight coupling were introduced which were also able to absorb (dampen) anticipated load peaks and help tune the system called resilient couplings. In 1960-1985 period the advancement in the systems were continued with more and more horsepower and higher speeds. As it is seen in 1960s many new types of gear couplings were introduced. Around this time standard line of tooth gear coupling was developed. In this period need of non-lubricant gear couplings grew rapidly. 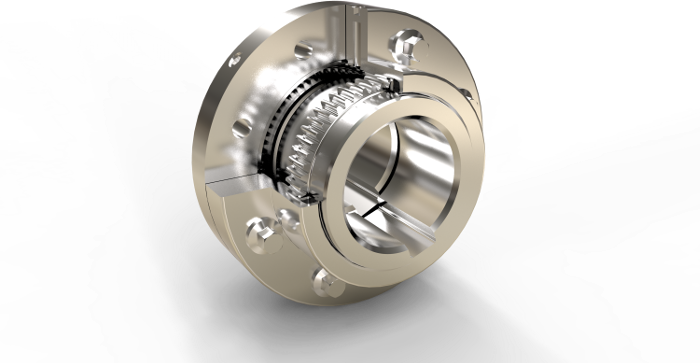 So gear couplings upgraded to meet new change of speed and torsional characteristics of power transmitting shafts. From 1985 to present time, a lot of advancements have happened in the gear coupling industry. These new advancements were the result of the use of new materials, finite element analysis (FEA) techniques, advanced manufacturing systems e.g. ; computer numerical control (CNC) and electron welding etc. A great example of these technological advancements is HercuFlex.